ATDC™ is fast developing a reputation as a leading provider of security barriers for commercial, industrial and retail applications, including shops, shopping centres, warehouses, loading docks, airports, hotels, pubs, clubs, government buildings, sports stadiums, convention centres, schools, universities, offices and wherever your premises are. 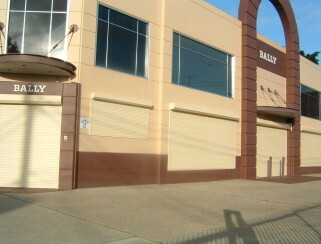 The Australian Trellis Door Co offers a selection of fences and safety barriers for Australian businesses. We also provide on-premises installations, barrier design services, and the onsite support you need. Our range barriers are designed to serve the needs of retail, commercial and industrial sites, as well as business operations. The Australian Trellis Door Co’s folding doors and gates are lightweight, tough and perfect for any type of environment where you need added external security. Our range of folding closures can be designed for all types of premises. These products are made for durability, low maintenance, and long life performance. We can also provide related products according to your onsite needs, including security grilles and other high-value security options. 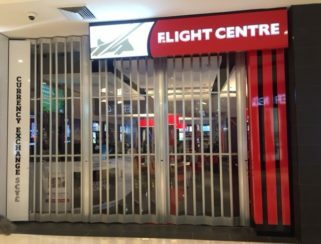 Our Commercial Roller Shutters provide excellent security after the hours of business. They roll up into a slimline box, or into the ceiling, so as to be totally invisible. Perfect for exposed entry points including glass shop-fronts, factory show-rooms, reception counters, canteens, sports arenas, clubs and other commercial, retail and industrial applications. 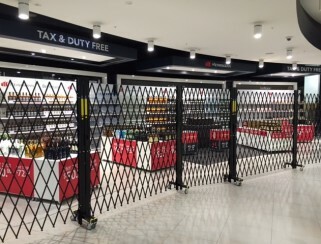 The Australian Trellis Door Co offers a range of security grille solutions for all types of premises and security coverage. Our range includes DIY options as well as our own onsite installation services. These very popular security options can be configured to doors, windows, and other access points. Our commercial shade systems are ideal for any type of business premises. These highly adaptable shading systems are the perfect solution to glare, shading problems, and exposed areas. We offer the latest aesthetic designs and a comprehensive range of services to assist with your needs. Our commercial shade systems are typically used in retail environments for managing problem areas affected by strong seasonal sun, and/or element exposure. Modern security doors include a wide range of options. These doors are very adaptable and they can be configured to any kind of commercial environment. If you’re looking for exterior security doors, awnings and other onsite solutions, The Australian Trellis Door Co. has the innovative solutions you need. Whether you’re upgrading an existing building or looking for security fittings for new commercial premises, we can help. This range includes folding security doors, commercial roller shutters, security trellis gates, and much more. Our state-of-the-art security doors incorporate high functionality with heavy duty performance. Our high-quality commercial expanding security doors, folding doors and commercial roller shutters offer a complete range of protection for all areas of your property. We can also assist with exterior presentation and design considerations. If you’re looking for any particular style or design of security door for your premises, just ask us. Our mobile expandable barriers and retractable mobile security barriers can be installed in any location according to your needs. These barriers are the very latest on the market. They can be used as crowd control gates, portable onsite security screens, or for any other security purpose. 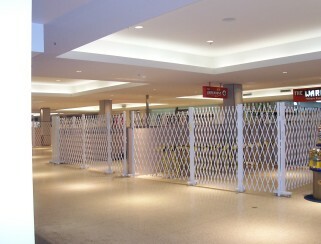 Our mobile security barriers are designed to provide effective screening and security for stock and premises. They can be moved to any location and configured to protect any area. 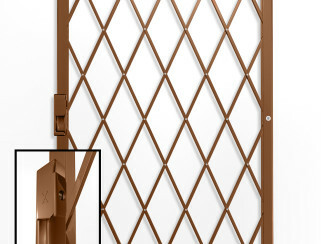 Our folding security grilles and closures are high quality and are the most space efficient on the market. They are perfect for retail shop-fronts, airports, reception areas and windows. Our DIY gates are designed to provide a flexible range of solutions for on-site security. These concertina gates can be installed in any space, including doors, windows, or access points, according to your needs. 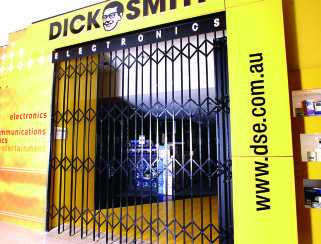 Ask us about security grilles, and managing access for sensitive high-security areas. ATDC commercial shade solutions include our innovative retractable awnings. These products are perfect for spaces affected by sun, rain, or other environmental conditions. 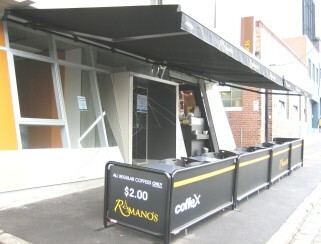 These awnings can be configured to any size required. For more information regarding our security systems, you can contact us online or simply ring the local ATDC centre in your capital city. Ask us about DIY options, commercial shade systems, design and technical guidance. We will provide any help you need.